Riometer measurements started 1965 and all Finnish stations since 1970. 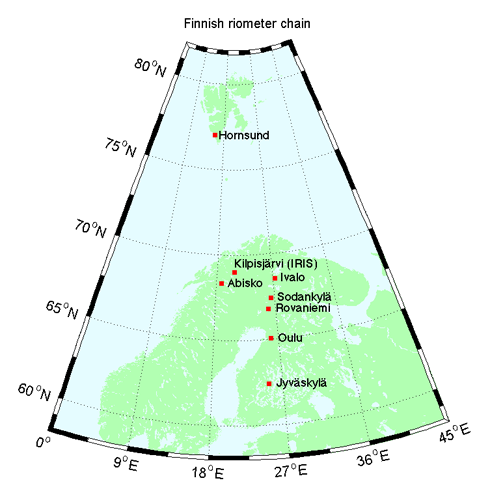 The Finnish Riometer Chain maintained by SGO includes observation sites in Kilpisjärvi, Ivalo, Sodankylä, Rovaniemi, Oulu, Jyväskylä and Nurmijärvi. Furthermore, in collaboration with the University of Lancaster, U.K., riometers were operated in Vidsel and Abisko (Sweden), in Ramfjord (Norway), in Hornsund (Svalbard), as well as the Imaging Riometer IRIS in Kilpisjärvi. Wide latitude coverage: 62°N to 70°N, Svalbard 77°N.